3D printing technology is becoming more ubiquitous by the day thanks to regular releases of new, cheaper and simpler printers. What was once a novel market is beginning to poke out of its niche, though the tech certainly hasn't gained widespread adoption. Still, is 3D printing becoming a buyers market? The short answer is yes. Throughout 2013 we saw an explosion of new 3D printers, some of which reached their lowest price points yet, such as the $199 (about £121/AU$217) QU-BD OneUp 3D. Admittedly, some assembly is required, but at a budget offering is certainly a sign of growing choice (and broader market reach) for the machinery. With a sizeable contingent of more affordable next-gen printers launching with the help of resources like Kickstarter, 3D printing is beginning to take a plunge in the mainstream consumer market. There's still a long way to go before we're all printing whatever item we need from the comfort of home, but the groundwork is certainly lain for next year and beyond to see a boom in 3D printing. In the last year alone, MakerBot Replicator 2 machines found themselves on sale in Microsoft retail stores with Windows 8.1 support to boot. Staples, meanwhile, started carrying 3D Systems' Cube 3D printers in May. One of the latest printers to join the big box store circuit was the Solidoodle 4, which is one of the few fully assembled 3D printers available for $999 (about £607/AU$1,092) at Micro Centers around the US. To help get a sense of the challenges of bringing 3D printers to retail, we spoke with Solidoodle's CEO and Founder Sam Cervantes. 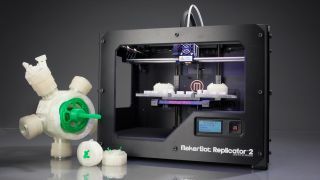 Cervantes said the Solidoodle 4 was made to be a retail evolution of the company's last printer, which produced 8-inch-squared parts with the same 0.1mm resolution as the MakerBot Replicator 2. What has changed is the outer casing - now it has it's finished with a plastic exterior. It's a small difference, but it makes the printer look more like a mini refrigerator that belong in the home than an out-of-place steel cube. "We want to make a machine with a clean, finished appearance and an easy-to-use product," Cervantes explained. Beyond looks, the Solidoodle 4 is also more user friendly. "The Solidoodle 4 is usable with no tools required. Previously, you had to use a screwdriver to set the first layer height [the starting layer of the print], but now we've included a thumbwheel that's accessible from the outside. You don't have to open the machine and use a tool." Beyond the availability of affordable, accessible and user-friendly machines, one of the largest barriers to 3D printing has always been the steep learning curve of sending designs to the printer. Cervantes said that the hardware is just one component; he and this team at Solidoodle have worked hard to create a series of one-click software for Macs, Windows and Linux to get its printers up and running within a few hours. "After you install the software you open the STL file and slice it just a couple of clicks and warm up your printer," Cervantes explained. "Once you're familiar with the whole process to go from turning on your printer and warming it up, it usually takes about five minutes, and most of that is warm up time." "It's easier than ever before to purchase a printer and start creating right away - your own 3D designs or the ones you find online," he continued. 3D printing is actually a decades old technology that's existed since the 1980s but primarily was only accessible to the manufacturing sector and community of tinkerers, such as the RepRap project. Along with the development of consumer priced printers that can sit on top of someone's desk, manufactuerers have strived to simplify the entire 3D model design process.